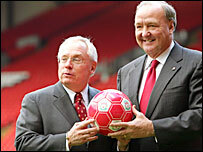 American tycoons George Gillett and Tom Hicks have secured unconditional control of Liverpool. Shareholders had been given until Monday to respond to the offer of £5,000 per share and the pair comfortably reached the 75% required. A statement to the Stock Exchange said the duo "received valid acceptances in respect of approximately 80.7% of Liverpool's issued share capital". Work on the club's new 60,000-seater stadium is set to start imminently. Gillett and Hicks, who both own NHL ice hockey franchises, watched Liverpool knock out Barcelona in the Champions League at Anfield on Tuesday. They will reportedly hold meetings on the new Stanley Park stadium within the next week. Liverpool chief executive Rick Parry told the Liverpool Echo: "It is an historic day for the club. It's obviously very pleasing to hear that George and Tom have reached the threshold they required and I'm sure they're equally delighted with the news. "It has not come as a great surprise to us because from the moment we accepted the bid the response has been positive. We had heard earlier in the week a positive announcement was imminent. "There are some formalities to go through before Tom and George take over as co-chairmen. Having received indications they can buy the shares, the process of purchasing now begins. That can take a week or two. "The next game they will be attending will be against Arsenal on 31 March, by which time the process should be concluded."